Notes: Notes: Meols Cop station was situated on the Liverpool, Southport & Preston Junction Railway (LSPJR) Barton Branch line that ran between two junctions with the West Lancashire Railway (WLR) on the east side of Southport to Altcar and Hillhouse on the Southport & Cheshire Lines Extension Railway (S&CLER). Meols Cop station was located just to the east of the WLR line. To its north-west the line split into two at Meols Cop Junction, one spur giving direct access to Southport via Hawkshead Street Junction and the other to Preston via Roe Lane Junction. serve growing eastern suburbs of Southport. The building had booking facilities, waiting rooms and toilets for both sexes. On the north-west side of the station was a goods yard with three sidings, later increased to four. In 1904 private sidings nearby served Bates & Co, Meols Cop Corporation and Southport Gas Works (the gas works connection having been agreed on 31 December 1891). In the early years after opening the station was served by trains between Southport Central and Barton, but from 1 November 1887 they were extended to run onto the S&CLER. From May 1888 services began to operate between Preston West Lancashire station and Liverpool Central via Meols Cop. By 1895 there were four weekday stopping services to Altcar & Hillhouse and five to Southport Central. The first departure for Altcar & Hillhouse was at 7:15am and the last was at 7:52pm. The first Southport Central Service departed at 8:39am and the last at 9:28pm. There were a couple of extra services on Saturdays and a Sunday service of three trains in each direction. The LSPJR and its sponsor the WLR struggled financially from the start and were insolvent by the 1890s. Despite grand plans both had become nothing more than local lines which, unfortunately, ran through sparsely populated areas for much of their length. As a result both companies were absorbed into the LYR on 15 July 1897. The LYR axed the service between Preston and Liverpool Central. The LYR immediately set about making changes. As well as upgrading the lines, which LYR surveyors found to be in a poor condition, the LYR was keen to integrate them into its own network. At Southport they did this by making alterations at Ash Street, west of Meols Cop. It was on the former WLR at a point where, for a short distance, the WLR ran parallel and close to the LYR Southport and Wigan line. A junction was installed, and from 1 May 1901 Southport services from Meols Cop were switched to Southport Chapel Street station. Southport Central was closed as a passenger station on the same day. In July 1906 the LYR introduced a ‘railmotor’ onto the Barton branch; they also opened halts to generate more traffic. The railmotor service became known as the ‘Altcar Bob’. Consisting of an engine and single coach combination with a driving cab at one end of the coach there are a number of suggestions why the service received its name. The original driver was possibly called Bob, or the name could be related to the ticket fare, a ‘bob’ being the general term for a shilling. More likely, the service was named ‘Altcar Bob’ by railwaymen who, in those days, referred to small engines affectionately as ‘Bob’. With the introduction of the railmotor Meols Cop station enjoyed an improved train service. 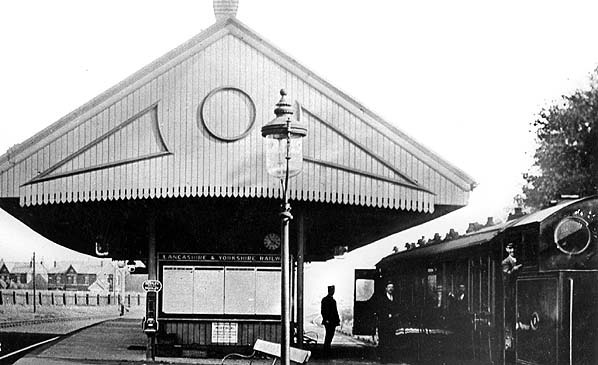 On 15 February 1909 Meols Cop station began to be served by electric trains between Southport and Crossens, introduced following the electrification of the lines between Hawkshead Street Junction and Meols Cop station, and between the station and Roe Lane Junction. The direct line between Southport and Crossens had been electrified in 1904, and the service was a great success from the start. The reason for the extension was twofold. First, the LYR recognised that Meols Cop served what had developed into a large residential area with a great deal of untapped commuter potential. Secondly the company needed an electric car repair and maintenance facility, and the location chosen was the centre of the Meols Cop triangle, just north-west of the station; the shed opened on 23 December 1912.
the short journey to Meols Cop Junction the train would take the spur to Roe Lane Junction giving direct access to Crossens. Trains from Crossens would also run into Meols Cop, perform the reverse operation, then run to Meols Cop Junction, but this time take the spur to Hawkshead Street Junction and proceed to Southport. Most services between Southport and Crossens operated via Meols Cop station after February 1909 providing it with an intensive service. On 13 February 1911 the LYR opened a line to the east of Meols Cop from Butts Lane Junction to connect the Barton branch with the Southport and Wigan line. This gave an alternative route into and out of Southport for trains using that line, allowing them to call at Meols Cop station. 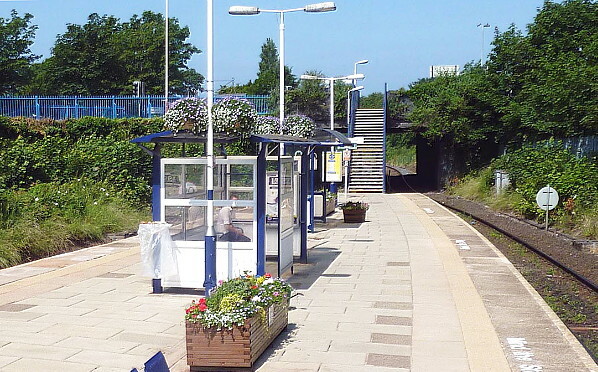 Some stopping services on the Southport and Wigan line began to operate via Meols Cop providing even more services at the station which had become the busiest by far on the former LSPJR. In January 1922 the LYR merged with the London & North Western Railway. In that year Meols Cop had 48 weekday electric services to Crossens, the first leaving at 5:42am and the last at 11:14pm. There were 46 services to Southport Chapel Street, the first at 6:03am and the last at 11:33pm. There were ten weekday ‘Altcar Bob’ railmotor services which ran to the Barton branch; seven of them terminated at Barton and three continued to Altcar & Hillhouse. There were also ten return workings from the branch to Southport Chapel Street. Just one year later the London & North Western Railway was absorbed into the London Midland & Scottish Railway (LMS). With effect from 13 November 1926 all passenger services running to the Barton Branch terminated at Barton (which the LMS had renamed Downholland on 2 June 1924) and Altcar & Hillhouse was no longer served. 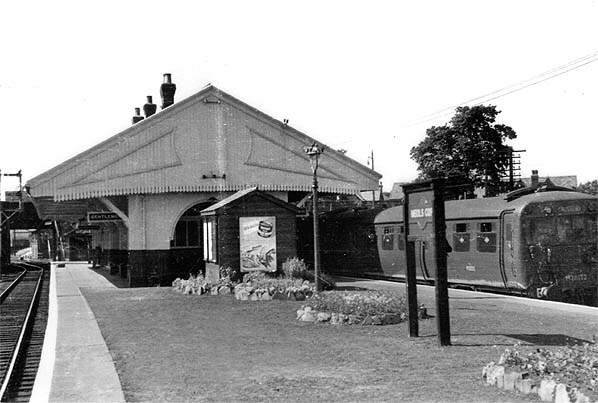 By summer 1932 Meols Cop station was served by ten Barton branch services in each direction on weekdays but extra trains ran on Saturdays. The first weekday departure for Downholland was at 6:49am and the last was at 9:29pm. There was an 11:07pm service to Downholland on Saturdays. The Barton branch was also served by seven trains in each direction on Sundays. There were 46 weekday electric services to Crossens, the first at 6:25am and the last at 11:25pm. There were 45 electric services to Southport from Meols Cop, the first departing at 6:53am and the last at 11:45pm. There was also a handful of trains to destinations along the Wigan line. Blowick station - on the direct Southport and Wigan line into Southport - closed in September 1939 more services were routed via Meols Cop. On 1 January 1948 Meols Cop became part of British Railways London Midland Region. In winter 1956 it still had its frequent electric service of 33 to Crossens and 34 to Southport Chapel Street. The first weekday departure for Crossens was at 7:09am and the last was at 10:59pm. The first weekday electric for Southport was at 6:49am and the last was at 11:17pm. There were two weekday morning trains to Ormskirk and two weekday evening services to Wigan Wallgate. The Reshaping of British Railways (‘Beeching’) report of 1963 recommended the complete closure of the railway from Southport and Meols Cop to Preston including the busy electric section, despite the fact that the services on the line were carrying over two million passengers per year. Moreover Beeching also listed the Southport – Liverpool electric service for closure, a proposal which apparently defied all logic, whilst leaving the Southport - Wigan line and all of its intermediate stations (including Meols Cop) untouched: even the remote and little-used Hoscar, Bescar Lane and New Lane stations were ignored by Beeching! These proposals would have left Southport with only the line to Wigan Wallgate and Manchester, and no link to Liverpool, the city with which its economy was most closely linked. Local protests failed to save the Southport / Meols Cop to Preston line, and all services were withdrawn with effect from 7 September 1964, so Meols Cop lost its frequent electric service. The last electrics had actually run on Saturday 5 September 1964 although empty stock workings into the electric car shed continued to run into Meols Cop station until 14 February 1970 when the shed closed. The former WLR line to Preston closed as a through route at the same time, although until 27 November 1967 a coal train continued to run up to Hesketh Park. The eastern spur of the triangle and the line up to Hesketh Park was officially closed on 23 June 1968. Prior to the closure of the route to Crossens and Preston, Meols Cop enjoyed only a modest number of visits by Southport – Wigan trains; trains were diverted from the direct ‘Blowick’ route to make calls at Meols Cop in the weekday morning peak period, then again from the evening peak onwards, with very few during the day, though on Sunday most trains travelled via Meols Cop and called there. However when the Southport – Crossens electrics were withdrawn in September 1964, Southport- Wigan trains continued their practice of avoiding Meols Cop between the morning and evening peak times, so the station’s train service was drastically reduced. On 14 June 1965 the direct route to Wigan from Southport via Blowick closed and all trains had to run through the former LSPJR through Meols Cop, even though – as noted above – many of them failed to call at the station. This ‘diversion’ of Southport – Wigan trains via Meols Cop did mean that one station remained in use to serve the eastern suburbs of Southport but, probably of more significance, the closure of the direct ‘Blowick’ route enabled the level crossing over Meols Cop road to be abandoned. 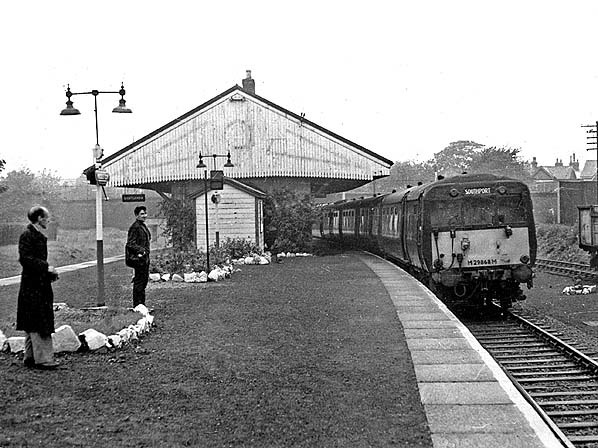 By the timetable of March 1967 Meols Cop had regained its ‘daytime’ service, but two months later, on 25 May, British Rail published a closure proposal for the Southport – Wigan line. The goods yard closed on 27 November 1967. On 27 May 1968 the Minister of Transport rejected the proposal, except for St Lukes Station which closed on 8 September 1968. Since then all intermediate stations on the route, including the isolated stations in the ‘mosslands’ have retained their passenger service. departure was for Manchester Victoria at 06:17 and the last was for Wigan Wallgate at 22:50. There were nine services to Manchester Victoria on Sundays. By 1987 the weekday frequencies were little altered, but trains had ceased to call on Sundays. The station remained a staffed facility until around 1990 and following de-staffing the original timber building was demolished over three Saturday nights between 26 February 2000 and 11 March 2000. Initially it was replaced with temporary wooden shelters on 6 April 2000. Bus stop style sheters were erected on Tuesday 18 April 2000. In 2008 Meols Cop once again began to be served by trains on Sundays. 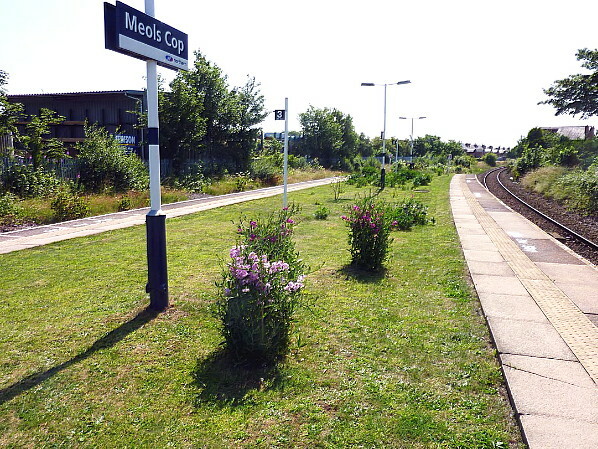 In the period from 1 April 2009 until 31 March 2010 Meols Cop station was used for 57,572 journeys which was a doubling of numbers over a five year period. Assisted by Cllr David Sumner a 'Friends of Meols Cop Station' group was formed in 2010. The group of local volunteers transformed the station by creating floral displays and keeping it tidy. Cllr Sumner was able to engage the local transport Merseytravel who provided additional bins and a second smaller shelter. The work of the volunteers assisted by local Girl Guides resulted in the station being awarded a 'Level 4 Thriving in North West in Bloom' award. The remarkable LSPJR survivor looks set for a secure future. Tickets from Michael Stewart, route maps drawn by Alan Young, BR timetable from Chris Totty, Bradshaw from Chris Hind. The 'Altcar Bob' railmotor at Meols Cop station at the end of the first decade of the 20th century. It is standing at the Southport platform, whose track was not electrified. It would have been en route to Southport Chapel Street from Altcar & Hillhouse. 1894 1:2,500 OS map. The LSPJR built a large station at this location in anticipation of housing developments that grew up around it. The other stations on the LSPJR were far more simple structures. 1911 1:2,500 OS map. 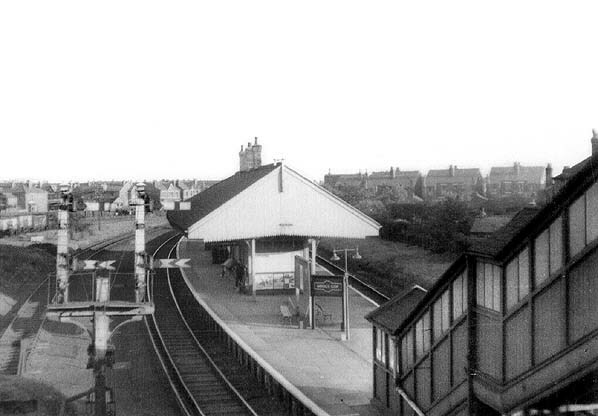 By this date Meols Cop station was surrounded by houses. It also enjoyed a frequent electric service both to Southport and Crossens. 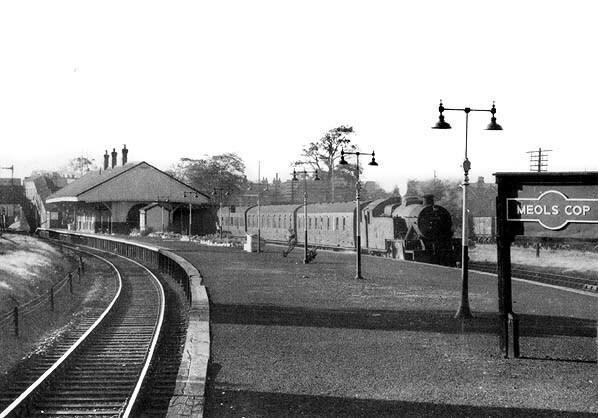 Meols Cop station looking towards Southport in 1949. The large timber station building with its generous verandah is seen on the single island platform. To the right is an ex-LMS EMU. It was standing in the ‘electrified platform’ and would shortly depart for either Southport Chapel Street or Crossens. Most electric trains between Southport and Crossens visited Meols Cop where they had to reverse to continue their journey. The electrification did not continue east of Meols Cop and, therefore, it was necessary to electrify the track at only one platform. 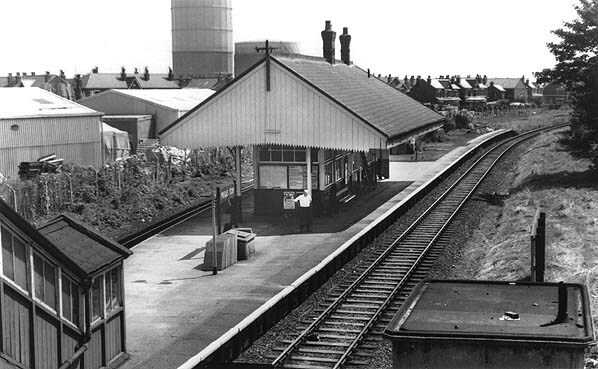 Meols Cop station looking northwest in 1960. A train heading towards Wigan can be seen departing. LMS ‘Hawkseye’ signs are still in place 13 years after nationalisation. Looking south-east at Meols Cop station in September 1963. The picture shows the side of the station that was served by electric trains. LMS signage is in place; BR (LMR) maroon running-in boards and totems would soon replace it, only months before British Rail’s ‘corporate identity’ programme would make coloured regional signs obsolete. 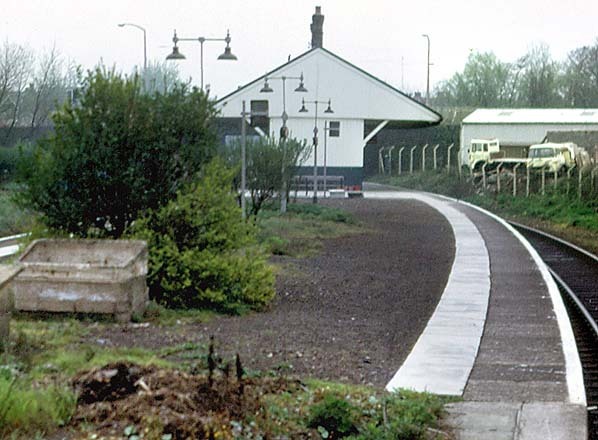 Meols Cop station looking south-east in the late 1960s. The station had lost its electric services in September 1964, but a live rail can still be seen on the line to the left of the island platform. Until 1970 it was used by electric trains running to Meols Cop electric car shed. As with the passenger services, they had to enter Meols Cop station and then reverse. After the electric service ended Meols Cop was served only by trains running on the Southport to Wigan line. Meols Cop station looking north-west in April 1974. 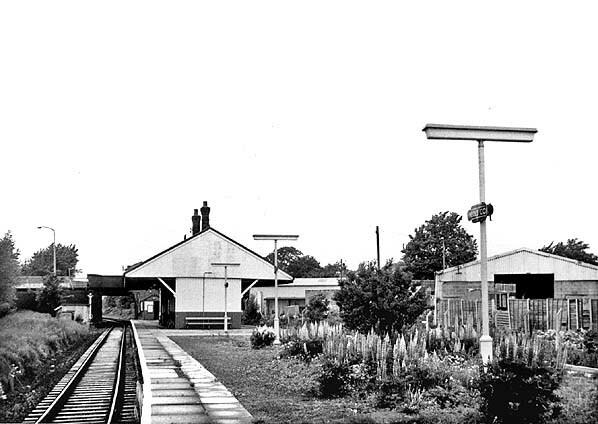 The platform to the right had been served by Southport - Crossens electric trains, but they ceased in September 1964. The live rails were removed in 1970 after the electric car shed closed. By 1974 only services between Southport and Wigan called at Meols Cop. The early BR electric lamps and BR totems are still in place. Meols Cop station looking north-west in June 1976. The station garden is in full bloom, with a fine display of lupins, but is not as well tended as hitherto. New fluorescent strip lighting has been installed and the obsolete totem signs have been fixed to them. Meols Cop Station looking north-west in July 1985. 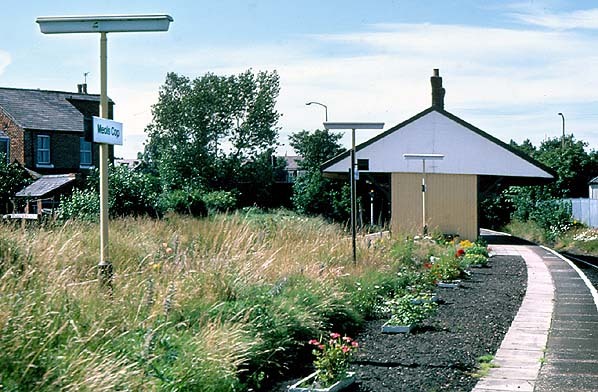 The station garden is overgrown, and maintenance is limited to the small rectangular beds set into the tarmac. BR ‘corporate identity’ signage has replaced the totems. Looking south-east at Meols Cop station in July 2013. To the left is the platform previously served by Southport Chapel Street – Crossens electric trains up to 5 September 1964. 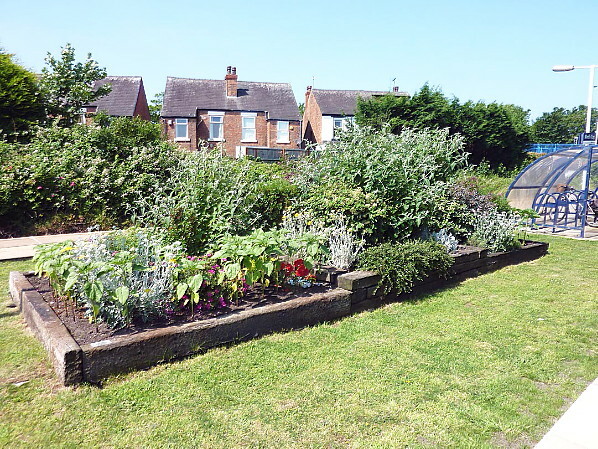 After suffering a period of neglect Meols Cop had by 2013 won awards for its floral displays and clean and tidy condition. The turn around was due the work of the 'Friends of Meols Cop Station'. Looking north-west at Meols Cop station’s island platform in July 2013. A floral display at Meols Cop station in July 2013.